(Updates from telegraphindia)Darjeeling/Siliguri, July 11: The withdrawal of nominations by nine rival candidates today ensured that the Gorkha Janmukti Morcha got a walkover in 22 GTA seats, just one short of the majority that will allow it to form the GTA Sabha on its own. Tomorrow, the final day for withdrawal of nominations, some more seats may go to the Morcha uncontested. Morcha chief Bimal Gurung had said last month that he would quit politics if the party failed to win all the 45 seats in the GTA elections. But the way matters have moved in the hills, the Morcha win now seems a matter of formality. Of the nine who withdrew from the fray today, three were from the seats where Gurung, his wife Asha and Morcha leader Binay Tamang are the Morcha contestants. Eight of the candidates who withdrew were from the CPM. Tomorrow evening, Gurung, Asha, Binay as well as Morcha general secretary Roshan Giri, vice-president Pradip Pradhan and leaders like Narbu G. Lama could be declared uncontested winners. Yesterday, the CPM had told its GTA candidates that it was up to them to contest or withdraw from the fray, making several leaders wonder if the Left party will stand by a candidate if he lands in trouble with the Morcha for contesting the election. Eleven Independents withdrew their nominations for the Kurseong-Giddapahar seat leaving Morcha candidate Anit Thapa the only candidate from the seat. Other uncontested seats from Kurseong are Tung-St Mary’s (Yogendra Rai) and Sittong-Latpanchar (Roshan Giri). The Yuva Morcha president from Kalimpong, Sunil Pradhan, will also be declared uncontested tomorrow from the Bung-Durpin seat as his two rivals — Gautam Kalikotey of Trinamul and Shivani Yarosha Pradhan of the Rastriya Janadhikar Suraksha Party — today withdrew their nominations. 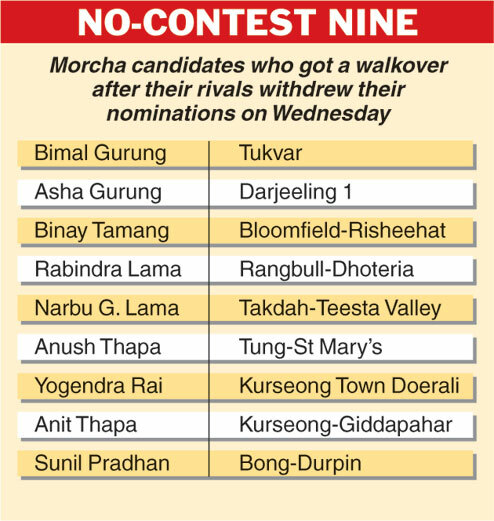 Of the 13 seats in the Kalimpong subdivision, Morcha candidates are uncontested in four seats while nine Trinamul candidates are still in fray in other seats. The lone CPM candidate, Pyatu Lepcha also withdrew his nominations from Kalimpong today. Seventeen Trinamul candidates are still in the fray across the hills. The CPM candidates still in the fray are from Rimbick-Lodhama, Relling-Kaijalia, Pul-Bijanbari, Sukhia-Maneybhanjyan and the Chongtong-Marybong seat in Darjeeling district.